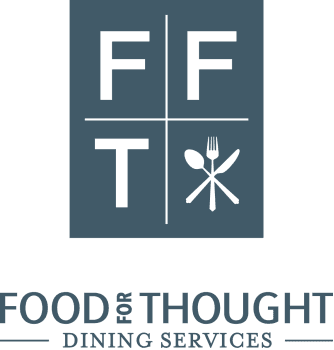 Food For Thought’s Express Catering Menus allow you to plan a meeting or group celebration without having to leave your office. All catering orders with custom menu items must be placed at least one full week in advance, with less than a week’s notice we may not be able to accommodate selected offerings. We are happy to provide you with any additional services you may require for your complete event. Wait-Staff, Flower Arrangements, Decorations, Custom Linens and China , can all be facilitated for your event. We can also assist with recommendations of outside venues and entertainment for your gathering. Call the Location Manager for more information.